From something as serious as impetigo to a milder skin condition, such as diaper rash, anything even slightly off about our baby’s skin can send any parent into a panic. The more we can understand what kind of skin care our baby needs, the better we can be prepared to treat their delicate skin. 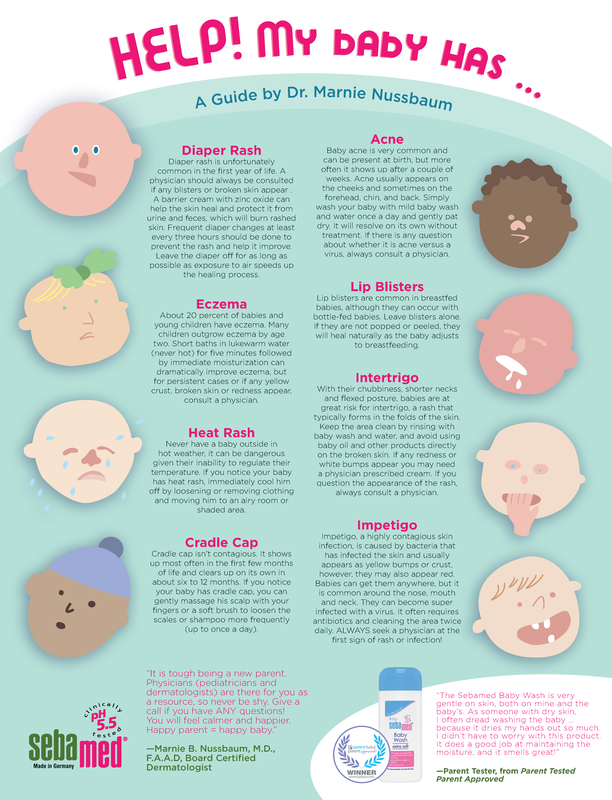 This baby infographic goes through the different types of possible (and most common) skin conditions your infant could be dealing with on a daily basis. Moms and Dads, let this information and baby infographic put you at ease as you put your baby to sleep at night. Click here if you’d like more information on our Parent Tested Parent Approved product winner Sebamed Baby Wash, featured in this baby infographic. Unlike soap that can cause dryness and irritation, Sebamed Baby Wash’s ultra mild emollient formula uniquely supports the moisture balance of your baby’s delicate skin. Gentle enough to use every day, this moisturizing cleanser naturally softens and soothes with allantoin and squalane to keep even the most sensitive baby skin at its huggable, healthy best. Sebamed pH 5.5 The Science Behind Healthy Skin All Baby Sebamed products are meticulously formulated to naturally protect a baby’s delicate skin. A newborn’s skin lacks the natural hydrolipid protective barrier, which is established during the first few months of life. Every Sebamed product has a pH balance of exactly 5.5 – precisely the pH required to support this barrier. The Wash Extra Soft gently cleanses your child’s skin with a mild formula. Your baby’s extra-delicate skin requires the best care – and that means bathing baby with soap-free body wash. Our Baby Wash Extra Soft was created without soap to help protect your child from skin rashes, dryness and other skin conditions that can result from using harsh cleansers. For a complete care routine for your little one, moisturize their skin with our Baby Lotion or Baby Cream Extra Soft after every baby’s bubble bath.